Click the thumbnails to access galleries of samples. 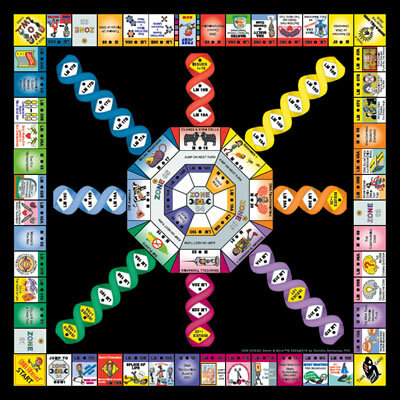 Game Board maps the entire DNA story: discoveries leading up to the DNA revolution in the RIM; tools used in DNA science and biotechnology in the center HUB; and major applications of DNA science plus related issues in the 8 HELIXES. Pictures on every Claim Card are clues to the Card’s content; hopefully, they will also inspire you to create productions based on that content. All-U-Need Booklet contains Message from DNA Ahead™ Creator, Rules, Strategy and Other Tips, Titles + Votes for Claim Cards, and Sample Ballot/Wins Tracker. Hands-On Picture Science (HOPS) approach prompts viewers to observe clues, think critically, and create productions that spread DNA savvy. HOPS can be used for any science topic with any group anywhere. 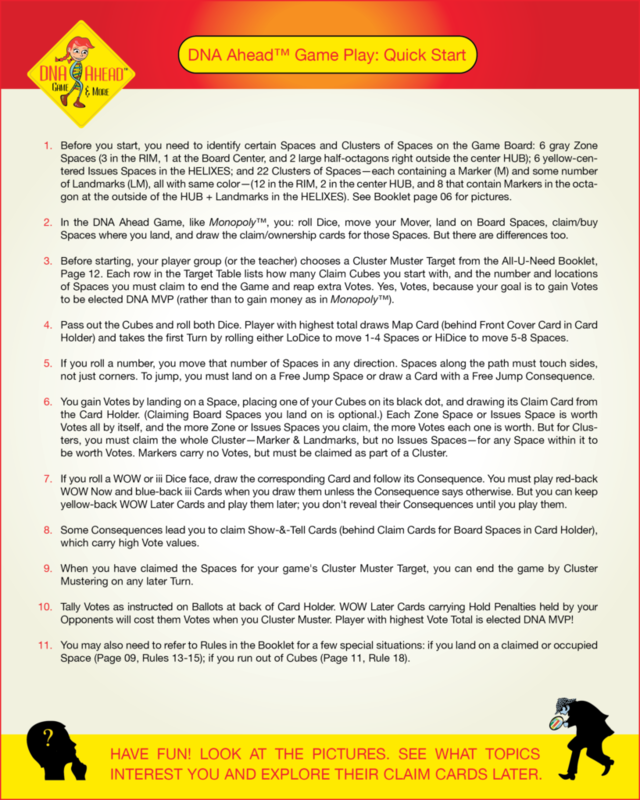 Claim Cards for Board Spaces elaborate the DNA story. Chuckle at the humorous pictures as you ride the minds of scientists (and of heroic molecules and tools). If the DNA landscape is new to you, scan the entire terrain by viewing the 6 Zone Claim Cards, then zoom in on content of your choice via the Claim Cards for Markers (22 total) and Landmarks (90 total) within a chosen Zone; and visit the Issues Claim Cards (7 total) to learn about the often controversial issues associated with some uses of DNA technology. Show-&-Tell Creativity Cards (20 total) suggest many ways to use the Game content to spark your own new thoughts and creative productions. The Activities target a wide range of interests and talents; supports for Your Show-&-Tell efforts are planned for the You’re Invited page of this website. Issues-Insights-Innovations (iii) Cards (90 total) feature evidence and beliefs bearing on issues outlined on the 7 Issues Claim Cards plus recent newsworthy DNA-related developments. Yes, DNA Ahead Game & More™ has oodles more content than most other games; it offers a mind-enhancing smorgasbord to be sampled, savored, and exploited by diners ranging from science-strangers to science-mavens. Click for Questions to Help You Decide.